*Disclaimer: unless it’s a ridiculous question about what bra size I am! Why the name "The Overlanders"? How can you afford to live like this? How do you get used to different types of food? What UK food do you miss the most whilst travelling? What is the worst thing you have ever eaten? How much do you spend on average? Where do we wash/Go to the toilette? Where is the hardest place you have been for communication? Which are your favourite countries? What camera do you shoot with, and how do you make videos? When does your next trip start? Which country are you looking forward to visiting the most? Which country are you least looking forward to visiting? What will you do after South America? what advice would you give to someone wanting to do their own overland trip? Why do the repairs yourself when you are not a mechanic? How do you get/make electricity? What Sort Of Fuel Costs Do You Experience? What Is The Availability Of Fuel In Other Countries? And What Quantity Do You Carry? have you had any accidents? what about police / boarders / corruption? Whats your must have gear? What did you not pack that you miss? What did you pack that you never use? Why the name ‘The Overlanders’? I believe the best method of travelling and feeling like I've really seen a place is overlanding through a continent. Also someone ‘stole’ the name I wanted. I save all of our money for trips before I set off, by working every hour and every day possible, selling almost everything I own via eBay or car-boot sales and being meticulous about a budget whilst on the road. I’ve both come from a ‘normal’ working-class backgrounds, had state school education and never been given any handouts. You don’t have to be a trust-fund baby or win a chunk of cash to travel. You just have to prioritise. There’s really no big secret to it. Despite what some people may think, 99% of travel blogs (including ours), will not make anywhere near enough to live on, so I really do this as a way of helping fellow travellers out and if people buy pictures then happy days – that’s an activity paid for. I rarely pay to park up, use campsites or hostels/hotels. I also don’t charge other people to stay with me; if I’ve got the space, the beds are for sharing. However, I ask people to share the cost of fuel, tolls and meals, as van maintenance is one of my biggest (unpredictable) expenditures and I don’t ask anything to go towards that no matter how long you’re travelling with me for. I often get free water to have hot showers with and will cook from food purchased in local markets (or fishing), rather than eating out in restaurants. If you have any suggestions on how I can fund this trip, I’d love to hear from you and greatly appreciate the advice. My article ‘not all who wonder are lost’ explains it in more detail, but in summary I know that this lifestyle isn’t for everyone, but I’d rather live on a beach fishing for my dinner than sat in a traffic jam working for the man. I prefer the simple life now eg memories over possessions. However, it’s not all rainbows and unicorns eg travel can break relationships/friendships. I still think it’s one of the hardest things to do as a couple as explained in our article ‘make or break’. As it would happen, after travelling around Central and South America, Gwyn and I went to work in different countries to get money together for the next trip. I found out he was cheating on me with a girl he met at work (a job I ironically got him). C'est le vie. But minus the knife attacks, being detained in foreign prisons, being robbed several times, breaking my arm, being bribed countless times, the breakdowns, the break-ins, having malaria AND dengue fever, travelling is still what I live for. Despite having doubts about it all when things get tough, I have now been to over 100 countries and lived abroad in Europe, Asia, Africa and North America. Travelling to me is all about animal encounters, quirky festivals, national parks, interesting and new activities, and architecture (if I had to name a top 5). Although I do hit the tourist hot spots, equally my off-the-beaten-track explorations have been some of the most rewarding encounters. I will never forget surfing in a non-tourist destination in Costa Rica with the Pacific Ocean behind us and jungle backdrop against the most pristine stretches of sand we’ve ever seen. Then I thought I heard Gwyn bail on his board, only to see two humpback whales breaching and slapping their fins against the water, entertaining us for 30 minutes like something out of a 'SeaWorld Show'. Never would I have thought we'd be surfing with whales. National Geographic eat your heart out. If we were travelling by public transport we would have missed out on many of our favorite moments like this. Not to mention the freedom and ability to stop when we want, go where we want and leave when we want. We tend to cook from food purchased in local markets (or fishing), rather than eating out in restaurants. I have found that third world countries have more accessibility and variety of organic fresh ingredients than first world countries and at a fraction of the cost too. Winner, winner, chicken dinner (literally). I do get a little excited when I see the golden arches though (for the free Wi-Fi of course ;)). It saved us in China; if I had to eat rice for breakfast, lunch or dinner one more time, I would’ve eaten Gwyn’s arm off. Street food can be surprisingly really safe and very tasty, so don’t let the surroundings mislead you. It’s part of the adventure anyways. Travelling with other people and having my own cooking facilities, means that the food budget doesn’t tend to be too out of control, which is coming from self-proclaimed foodies like myself (and I eat a lot). Breakfast will usually be cereal (western habits) and fruit. Lunch will be a light snack as I'm usually on the go. Dinner is the biggest meal of the day for myself and I'm cooking it’ll be western favourites like spaghetti bolognese, fajitas, curry, or a BBQ. How do you manage to get used to the different types of food? I'm very open to trying new foods, no matter how weird or disgusting it looks, as I think it’s an important part of the travelling experience. For my Central America foodie review, please click here. I’ve usually been able to get my western food fix but China was probably the most difficult country for this (outside of Hong Kong, Beijing and Shanghai) and I tasted a lot of yickness before finding a few dishes and sticking to them. Sometimes you simply don’t get used to it, you just have to seek out what you like from trial and error. Which UK food do you miss the most whilst travelling? I’m a northern girl so I miss my steak and kidney pudding, chips and gravy on a Friday night (it’s the law). I need to find me a travelling chef! I got excited once when I saw Marmite and bought it for $10USD. It was worth it. I'm excited to heading back to Argentina for steaks and the famous BBQs there. What’s the worst thing you have ever eaten? Nothing has ever made me heave like when I ate a millipede. Gwyn filmed me doing it too and it was the pressure of the camera that stopped it reappearing in mush form over the lens. China probably wins hands down for the most vile food ‘treats’ I’ve ever come across, but unfortunately as English is not widely spoken and the language looks like Egyptian hieroglyphics, I couldn’t even begin to guess the name of 80% of the things I tried. I will try anything though, apart from dog. Seeing them being processed was horrific and as we’re massive dog lovers we just couldn’t do it. Obviously spending varies depending on the country you are in. I have always told first time travellers (out of the comforts of resorts and packaged holidays) that for budget travel you need to be looking at a minimum of 1000GBP (or $1500USD) per month per person. This should be able to get you a basic hostel dorm room for the night, public transport to move to and from places, cheap food (street food/markets), some activities and a few souvenirs (if that is your bag). I’d rather save up longer and actually get to do stuff in the countries than miss out on doing so much. I always run with the ‘I might only be here once’ philosophy and want to make the most of it. With this in mind, I up my budget to $2000USD per month and can pretty much do anything I want on that IF I keep track of my daily budget and aren’t frivolous with money on things I don’t actually need. Please note that travelling with someone makes it a lot more cheaper due to either private room deals in hostels, cooking together (is a cheaper option than eating out), sharing transportation, etc. Having your own vehicle will save you even more too. Yes, the initial outlay is steep, and obviously I have fuel to fork out for, toll road charges and maintenance/repair costs, but this is not every day and if you think what I save on eg accommodation, transportation and more importantly time, I think it’s the winning option. As I have yet to write up the budgets of other countries I have been too, I’ll give a brief over-view of our Central and South America budget (based on two people travelling together). The cheapest countries in Central America are Nicaragua and Guatemala; the most expensive are Belize and Costa Rica, with El Salvador and Mexico somewhere in the middle. A lot of South America is cheap enough, with Argentina and Chile being the most expensive. Brazil isn’t meant to be cheap, but I’ll let you know how I get on. Again, the rule of $2000USD per person, per month applies, but sometimes we come way under. Rest assured it all balances out and they’ll be costs you haven’t accounted for. I like to think I'm fairly savvy at guessing what budget is required for each country, given I do plenty of research before I set-off, but even now I get surprises. Always budget for a contingency fund, even if it’s just having a credit card with $3000USD on it, incase you need it to get home or have medical costs. Even with decent travel insurance, you might have to pay up front for costs and then claim this back later. 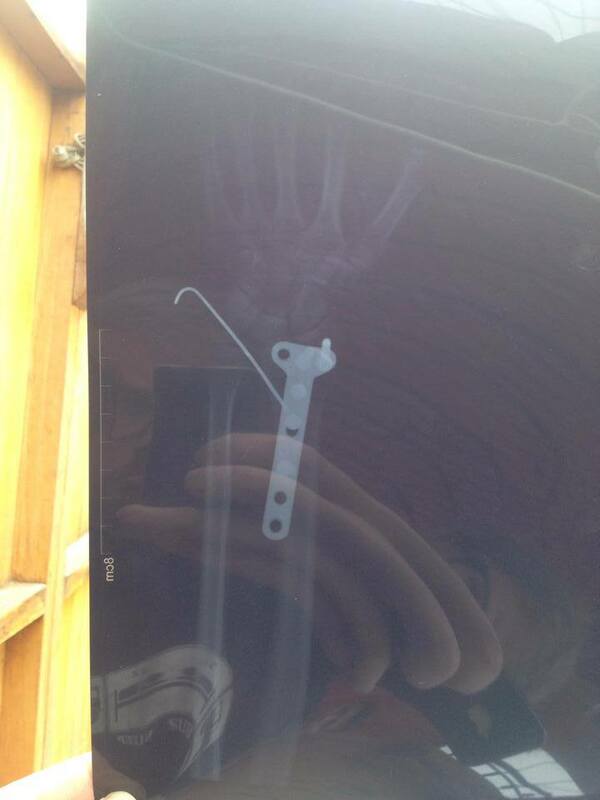 My broken arm cost me $3000USD in Peru for example! To give you an idea of where my pennies go, please see the overall Central America budget. To get a more precise idea of what I spend where within that region, click on the individual countries. I’ll be writing an article about budget planning and keeping tabs on spending. Unless you’ve come into a massive wedge of money, this is an important skill when you travel, especially on a long-term basis. In India, I thought we’d been robbed, as we didn’t know where all our money went. We spent hours going through every last rupee and realised between us both we’d spent $300USD on milkshakes alone in 2 weeks. Idiots, I know, but you’d be surprised how a lot of travellers do not have control over their budget. Lesson learnt. Where do we wash/go to the toilet? I often get free water (mainly from garages) to fill up the 100L tanks. The water is heated by diesel, which then comes out in a pressurised shower system out of the back of Kermit. This is luxury overlanding, people. I'm also a fan of embracing nature by skinny dipping in rivers, waterfalls, and the sea. More out of laziness really. Toilets (or lack thereof) are the biggest pain, but despite the fact I used to want to remain some mystery with Gwyn, we used to go wherever. In cities, I’ll just be cheeky and use a restaurant or hotel. I’ve not been questioned yet. You’re not an overlander until you’ve had a nature poo or the ultimate…aqua (sea) poo. I try to avoid spending too much time in the bigger cities, as they just aren’t campervan friendly and they tend to be more unsafe than out in the country. Once, in Mexico City we got a city centre hotel with free parking. If you’ve been there, you’ll probably understand why and the $20USD it cost us was money well spent for that night. Even so I rarely stay in campsites – again only if I'm in a city and there’s an overlanding community eg Cusco in Peru. I begrudge paying for parking, so I’ll opt to park up outside 24-hour businesses like fuel stations or McDonalds. Plus you can use their toilets and get drinks (or burgers) if needed ;). I’ve also stayed outside police stations if I feel I am somewhere particularly sketchy. I might have been lucky, but I’ve never had any problems staying outside of cities in isolated spots (by myself or with others), and they’ve always given the most beautiful surprise views to wake up to in the morning too. What's the hardest place you have been for communication? First world problems – oh how I miss fast Wi-Fi. Wi-Fi was least available in Central Africa, but as that trip was 6 years ago, I assume it’ll be much better now. Even the internet cafes there would take 30 minutes to load up my emails. Frustrating is one word for it. I use Facebook to keep in contact with friends, but some countries (eg China) have a complete block on social media sites. I have a VPN (Tunnel Bear) now, which gets around this little problem. I also use Skype to keep in contact with family and friends, but the quality of the phone calls can be hit or miss, even if I’ve sneaked into a five star hotel/restaurant. Don’t rely on it being anything like it is back home. There is often a split opinion between travellers who want to wing-it on their adventures and go with the flow, or those who believe that planning wins out. From experience of travelling both styles, I am now converted to the latter way of exploring. I use guidebooks, forums, and get advice from people, before we go. I plan more than anyone I know (I actually do full-on day by day excel spreadsheets with all the little details) and always maintain that a smart traveller reads up before they go. However, with that being said, just because I have a plan it is not necessary to remove spontaneity from a trip. Sometimes I don’t know the best things about a place until I get there. I allow flexi time and talk to locals and see if there are special things happening in the area. Many of our favourite memories have been on local recommendations; those guidebooks only cover the basics. If we think we need two days for a visit, we plan to stay for three or four. Also, nothing kills a trip like the stress of trying to do too much. This definitely happened to us on our Central America Expedition. A long flight, weather, bad food, mechanical problems with a car can quickly change plans. We missed going to El Salvador altogether as 50 miles before the border, we broke down in Guatemala, wasting a week sitting in a mechanics yard rather than surfing those Salvi waves. We had several non-refundable/non-transferable activities/flights in the next countries, so we didn’t have time to see El Salvador. So, if you haven’t left enough flexi time, things are going to get stressful. What are your favourite countries? Africa was the first continent I did where I covered some serious ground and did a lot of country hopping. I have a soft spot for South Africa, as it has so much to offer, but I was also relieved to be getting off the van having shared it with some truly first class w**kers for 4 months. My best independent overland trip to date was probably North America when we did 33 American states and 3 Canadian provinces. The national parks in this continent are unbeatable in terms of diversity and accessibility. My favourite place in Europe is Italy. I love the history, architecture, food and wine…everything. Nobody can hate this place. In Central America, Costa Rica and Guatemala peak for me. Costa Rica for its national parks, beaches and wildlife; Guatemala for its ruins, culture and people. In South America being on the first class live aboard diving around The Galápagos Islands was a once-in-a-lifetime opportunity, but it definitely stung our budget. In the Oceania continent, it's New Zealand. Sorry Oz. Things are closer, cheaper and I love the laid-back lifestyle. Sweet as. And the winner in Asia is China at the moment. It's so wonderfully weird. I haven't been to Japan yet though, and I've heard that's on a whole new level of bizarreness too. My favourite islands are Cuba and Fiji. What camera do you shoot with and how do you make the videos? I use a Canon 5D for pictures and a Canon G1X and GoPro Hero4 for filming. I currently use Lightroom for picture editing and iMovie for video footage editing. If you have an idea for a video, want to collaborate on a project or want to see a specific topic filmed, please get in touch. When does your next trip start and where? • THEN back to Brazil for 1/2 months in February (for Rio Carnival) to March. For more information on this and to find out how YOU can be part of it, click here. I can’t wait to get back to Venezuela. It’s a country like no other. It’s so crazy messed up and what place has savannah plains, Caribbean coast, the Andes and rainforest?! I also am massively excited to get back to The Galapagos (one of my favourite places in the world) and visit Antarctica, as it’s just such a different ‘holiday’ destination. Gwyn is looking forward to going back to Chile as it has Torres de Paine, epic mountain ranges, desolate roads, some cool cities in the middle, deserts filled with geezers, and hot springs in the north. He’s also really looking forward to Bolivia. I think it’s for the pictures on the salt flats and every over lander we’ve met that has been there has banged on about this country. Interestingly, Gwyn is least looking forward to Venezuela, in contrast to my favourite country of choice. It’s too sketchy for his liking, which is understandable given our diary on our week there. I’m indifferent about the ‘little countries’ ie French Guiana, Suriname and Guyana, as we haven’t heard much about them from other people. I hope to be proved wrong. In an ideal world, we’d love to travel in Kermit for another 10 years, re-visiting places and making sure we truly conquer every country in the world and find the perfect place to settle down. Unfortunately, our budget just won’t allow it. Ah dreams. C’est le vie. If we can get a grip of funds, then there are talks of going back through Central America and up towards Alaska, if we don’t get sick of travelling by then or I don’t kick Gwyn off a mountain. Before we rocked up in the Latin world, our Spanish was non-existent. On a trip like this you will need some Spanish skills. We use a Lonely Planet phrase book and have found several of the free smartphone apps for learning Spanish useful. Learning some Spanish before you come out would be a worthwhile investment, or you could do it at the start of your trip, like many people we met did. Guatemala (San Pedro La Laguna) is very popular with tourists learning Spanish; it’s cheap (roughly $80USD for 4hrs per day, 5 days per week, one-on-one tuition); and it’s easy to understand Spanish. If you start in South America, consider getting lessons in either Peru, Colombia or Ecuador. Our article ‘why travel with a Land Rover’, answers this very question. With Dougal we used to ask ourselves this every day. Maybe it should be: what broke today? (Rover joke ;)). Dougal was actually fine for the first 5,000 miles, then he just kicked up a fuss in Guatemala and his issues started to mount from there. It was one thing after another and when he had his final hissy fit in Venezuela we shamelessly limped it back over the Andes (with only first and fourth gear working) to Colombia, so he could be sent home. We were sick of throwing money at him and although we knew it is part and parcel of overlanding, but we honestly don’t think he would’ve hacked the terrain further south, at altitude and the winter that was fast approaching in Argentina/Chile. It was the right decision to make. Kermit has been good to us so far, and having learned from our mistakes we are investing him and making him as mechanically sound as possible. We know that Land Rovers aren’t perfect (is any vehicle really? ), but the simplicity, ruggedness and all round practicality make it the best choice for over landing, especially for a continent with as diverse terrain and weather like South America. For better or worse, we now love our little home. It’s more than just a van to us. The Land Rover marque attracts people all over the world and we’ve lost count of how many conversations and friendships Dougal and Kermit have created for us. Without them both, we wouldn’t have half as many internet passengers. Plan. We used to have this winging-it attitude, which was fun and adventurous in our early 20s when we wanted to feel ‘alive’ when things started going wrong, however, lack of planning soon revealed problems that could have been avoided. I don’t doubt that has played a factor in having to bring Dougal back from South America, incurring unnecessary costs and stress. Buy a vehicle that suits your needs. If you take a VW camper to a country where the majority of roads are rocky and muddy, you’re going to struggle. If you take a 4x4 to a place where you will mainly be driving on roads, you are going to waste money in fuel. Also, reassess your thinking that having a big vehicle is the way forward. Bigger may give you more living space, but it will probably be more difficult to drive around towns, park up and will get noticed by the wrong type of people. Get to know your car - know every bump and rattle it makes. Get a good understanding of its mechanics. Buy a workshop manual and watch YouTube videos to build your knowledge. At the very least know how to change the consumable items - bearings, break pads, service fluids, filters and bushes. You will want to make sure that your vehicle is in good condition before you set off, change out any questionable parts and make sure you have spares for anything that breaks often. Don't just hope that your vehicle will last mechanically, be proactive and change things before you go. Don't wait for them to fail. If your van starts behaving badly, stop and fix it, and always do your scheduled maintenance, especially the 3000-mile tune-up. Try to do this yourself so you know it is done properly. Land rover parts can be hard to come by, but in most major cities there are part suppliers. Bearmach imports into most countries around the world - you can find full details of where they supply on their website. You should be able to find Land Rover specialists in Belize, Guatemala and Colombia. Models that are pre ECU will be easier to fix on the road due to reduced number of electrics and sensors. You would greatly benefit from fitting an engine monitoring system to see if you are asking too much of your vehicle and to spot problems far before they become an issue. We’d always recommend finding your local car clubs to where you are going and make contact. If anything goes wrong, they will be your support networks and we’ve met friends for life from these too. Think about your build logically and don't try to make products you want fitted over products that are better suited. Plan, plan, and plan. Try to get products that will have a dual use too eg now our water heater also heats the truck. Listen to the advice that other 'builders' have to offer, and be aware of the armchair warriors who are normally first to have an opinion based on zero practical experience. Live with your vehicle for a few months before you go. Do trial runs to iron out the niggles - in similar settings if possible eg not just staying in it over night on your drive. For your own benefit we recommend reading our shipping article to help with this process as it can be very stressful if you aren’t prepared. We can’t advise about what to do if you want to fly abroad and buy a vehicle when you get there, only that as a foreigner you can’t take a car out of Argentina during the first year of owning it. Google is your friend here, where you can double check the regulations on your destination before you get there. We have met people who have bought vehicles in places like Chile and Mexico, so it is doable. For us, we wanted to know our vehicle and do the build on home soil, giving us more time for prepping him, accessible to LR mechanics and experts, and cheaper products to fit Kermit with. Make sure you have ALL of the paperwork in order before you set off. Titles of ownership documents are vital. It goes without saying that you need to take 30 copies of everything - you’ll need roughly 10 copies just for the small crossing of Panama to Colombia and vice versa. Why do you do the repairs yourself when you are not a mechanic? Breakdowns generally happen when we least expect it, in the middle of nowhere, at an inconvenient time of day. Seeing as Gwyn has pretty much rebuilt Kermit this year, he is probably the best person to do the work. He knows Kermit and his quirks. Also Land Rovers aren’t that common in South America and people who know how to fix them to a good standard are even rarer. We got fed up of throwing money at the cowboy ‘mechanics’, only to find out their botched job came to light a couple of hundred miles later. That is the problem with travelling on a one-way road trip - it is always more economical to pay a grease monkey in the next town to fix the problem again, rather than pay the fuel to return to the last incompetent mechanic. Plus 90% of mechanics see that you come with a gringo price tag. All prices are negotiable even after the work has been done, so be cheeky and try to pay a fair price. Don’t get us wrong we have come across some really fair priced and competent mechanics, but a lot are very good at blagging you with their apparent skills when you’re distracted and stressed from the current problems. By no means are ‘we’ arrogantly claiming to be better than the ‘professional’ mechanics, but we do care more, and would rather do a better job than some quick fix. They charge for the parts and how big the job is so time is money for them; it’s not like the UK were they charge per hour. It has been (and still is) a steep learning curve and is one of the biggest challenges when you over land in your own vehicle. If Gwyn doesn’t think he can do a good enough job, or is clueless about what to do about a problem, then of course we’ll find the nearest mechanic - get on their good side, monitor what is being done and learn (even if it means Gwyn has to physically get underneath the vehicle with them), and, well, hope for the best that it won’t be money going down the drain. How do you get / make electricity? We have 2x 150w solar panels on our roof, which charge our auxiliary battery and run our fridge. A second alternator under the hood ensures we charge our batteries quickly whilst driving. The whole system is linked with an intelligent split charge system, which means our car battery will never go flat and we can start up Kermit anywhere. We can carry up to 180L. This should give us a range of around 1100 miles. Throughout Central and South America, fuel is on average between $0.50 to $1USD per L. Some countries are significantly lower eg Venezuela is an insane $0.05USD to fill up from empty (that's not a typo). Availability is no problem, but the quality can be. We have got fuel before which makes us smoke like a bus and we run a little rough, but these are few and far between. It may be virtually free in Venezuela to fill up your vehicle, but its quality is questionable. For a more detailed look at fuel per country, click for Central America, then once you’ve clicked the desired country, this information will be under the tab ‘Overlanding <insert country name>’ eg Overlanding Mexico. Again, we are currently writing up other countries and more of this information will be added. Throughout our travels we’ve had a few close shaves. Unsurprisingly, we had a few crashes in India (someone else was driving), but we were fine. In Mexico, Gwyn drove into a ferry. He still proclaims he is a better driver than me! Gwyn also once drove our rental car off a Cuban road and some cows came to rescue us. Apparently it was my navigating skills that caused this. You can judge for yourselves in the video. Also in Mexico, we knocked down a child. The kid is now completely fine, but for the full story of this disaster story see here. In Panama, we went to visit a bird sanctuary. After driving an hour out of our way we were pretty annoyed at the shocking price increase from the guidebook and out of principle decided not to go in. In our distraction, Gwyn turned the van around in the car park, hit a tree and Dougal’s back door fell off. An old bolt and duct tape came to the rescue. Other than that and considering how much distance we’ve covered in our years on the road, touch wood, we’ve had no major accidents. We have wrote a few pointers about overlanding through Central America countries here, as Latino drivers seem to dance to their own beat. Mexico in particular is probably the worst country we have driven in. Please note that in most of these countries, any accident involving a foreign driver is automatically the foreigner’s fault. 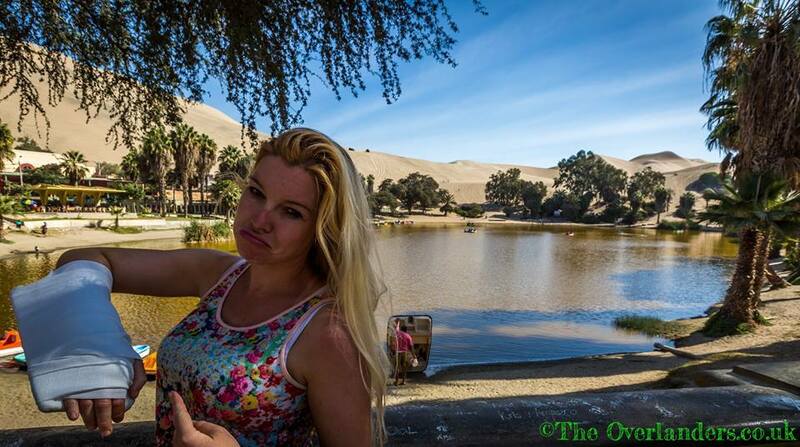 In non-related car accident, Linzi broke her arm sand boarding down a sand dune in Peru. She ended up having emergency surgery in a Peruvian hospital, only for them to mess it up. It’s healed now and with physio it’s finally getting better. Three youths tried to rob us at knifepoint in Nicaragua . Although they didn’t manage to take anything, unfortunately damage was caused to poor Gwyn as you can in the picture on the above link. I also got my travel towel and trekking sandals stolen from a dorm room in Fiji and Gwyn had his sweaty trainers swiped in a hostel in Colombia. Talk about gross items to steal. In Mexico, we broke down at the side of the road and as I went to help Gwyn at the front, I stupidly left my phone on the kitchen inside the van, with the doors wide open. As we were pre-occupied working on the van, someone grabbed the phone. This one was definitely my fault. We’ve also had people try our door handles at night, whilst we’ve been inside. The worst incident was in Peru, when we parked up outside a supermarket at 2pm on a busy road and a tuk tuk driver smashed the passenger window and stole a bag containing $7,000USD worth of things, including camera equipment, a passport containing a USA visa, etc. We managed to get CCTV footage and saw how he smashed and grabbed all within 30 seconds. To say we were distraught would be an understatement. We then had to drive 3 hours one way back to Lima to get the window fixed. We never got the bag back. Security is always our top priority every time we leave our vulnerable home. Given the above unfortunate incidences we have made modifications to Kermit to reduce the risk of being robbed again. Click here to see what we have done to him now. I wanted to go for lasers, but apparently it’s illegal?! Learn from our mistakes, although the last incident in Peru could not have been avoided. We were just in the wrong place, at the wrong time there. Keep everything out of sight when you are away from home (we even have a wrap/curtains to cover the front window), and keep everything in-sight when you are at home. Always lock up, even if it’s just to take a quick snap of a view for 1 minute. Unfortunately corruption is rife in Central America, South America and Africa. We found the safest country to be China. The most corrupt country has been Mexico. Athough many would think I would list an African country here, for most of the time I was travelling in a tour group, so I was ‘shielded’ from that side of things. We didn’t have any problems in North America, Europe or Oceania, and if anything, police would go out their way to help you in these continents. Asia offers a mixed bag, depending what country you’re in. Most of what tourists will report will be opportunist crime, so practice common sense – don’t go out on your own at night, don’t wear expensive jewellry or wave your camera or phone about, go easy on getting wasted so you still have your wits about you in unfamiliar places. We’re all for new experiences and the ‘try anything once’ but if you’re caught with drugs, many third world countries operate a zero tolerance. They don’t go easy on foreigners when you’re crying for mummy. We’ve heard real-life horror stories and your embassy will probably not be able to help you. Speaking of embassies – I have found they’re pretty useless. You’re on your own. Don’t assume you’ll be bailed out and your rights respected. These people dance to their own tune. Money does talk, but play the poor card and again they should get bored. I did the same thing when Gwyn was detained in a Mexican prison. If you’re over landing, be prepared to be pulled over a lot, especially if you’re driving an obvious foreign vehicle. This gets very tiresome - we lost count when we hit being pulled over 30 times in Venezulea in 7 hours. We’ve tried a whole bunch of tactics but the easiest and quickest way (in a Spanish speaking country) is: “mi no hablo Espaňol bueno”. Just make sure you don’t speak a word of it and they soon tire and send you on your way. Be polite and patient, as more often than not they are just bored and curious. Gwyn and I will often play the good cop/bad cop when it’s apparent they’re after bribes for whatever crap they’ve decided to make up. A good example of this can was when we entered Mexico City. He’ll be the nice reasonable person and I’ll be the impatient spouse. We strongly advise not to hand over any original documents that can be held as ransom. It’s worth noting that the Mexican police are known to take your licence plates, so it’s a good idea to replace the screws with rivets. Also, please for the sake of other future travellers, avoid giving them even a single dollar as it just encourages them to continue being corrupt little s**ts. They will get bored. We have never had to pay a bribe yet. We do carry some old (broken) phones with us, in the event we don’t think they’ll let us free. We have known other over landers to have a few bottles of cold Coca-Colas to speed up the questioning process. As a general rule, be sensible, keep an ear to the ground for political unrest, and trust your instinct. We also listen to local’s advice. As for borders, they can take between 1 and 3 hours on average. They are quietest early in the morning. Don’t pay anything without proof of the ‘tax/charge/fee and always get a receipt. It’s not a good idea to overstay your visa, like I did in Peru, and it is a terrible idea to overstay your car temporary import permit. Contrary to popular belief the money change touts on both sides of the border are often the best (and sometimes the only) place to change local currencies. We’d recommend changing up the equivalent of a few hundred dollars, then change the rest at banks in cities/major towns to get a better rate. American dollars throughout the world are easy to change up, so we’d always recommend you having some tucked away. There are often guides at the borders who will hold your hand for a tip. Believe us - you don’t need help. Electricals: Camera and filming equipment, with spare batteries and spare memory cards; hard drive full of films; mini-speakers, head torch. Clothing: Convertible pants/shorts; trekking sandals; sarong; lightweight rain/wind resistant jacket; walking/hiking boots; trainer socks and longer ones for insect-infested places; light-weight rain trousers; quick dry clothing in general. Packing: Decent sleeping bag and/or sleeping bag liner (we recommend silk); a pillow (avoid the compact/blow-up travel ones for long-term travelling), 2 x pillowcases; packing cells/cubes; waterproof (dry) bags; backpack (that is accessible without delving in from the top); backpack rain cover; small day bag. Camping: Head torch; travel cup with lid for drinking whilst driving over bumpy ground; zip-ties; duct tape (if you can't duct it, f**k it); multi-tool pen knife (we recommend Leatherman); toilet paper; carabiners; plastic zip lock bags; ear plugs and sleep mask (although we never personally use these, many other people do); washing line; She-wee (for the ladies); expandable cup/plate/bowl; travel fork/knife/spork (although for long-term travel in a van, we also have a normal set); travel micro fibre towel; couple of spare blankets; lighter; TSA approved travel padlocks; pack of cards. Medical: A first aid kit should include the following: disposal gloves, scissors, tweezers, safety pins, splinter removal tool, saline solution, band aids, alcohol wipes, thermal blanket, dressing tape, wound dressing, non-adherent pad, elastic support bandage, triangular bandage. Medication should include: paracetamol, motion sickness tablets, electrolyte powder satchels, itch relief cream, tiger balm, antibiotics (like penicillin, if you can get hold of them). Miscellaneous: plastic document folder filled with copies of your passport, visas, vehicle documents, vaccinations certificates. If you have any ideas for essentials, please let us know. We like to think we’re clued up on packing now, but we do miss not having an oven and English food. For practical reasons, we just can’t pack this stuff. Gwyn is low maintenance (of course), but I do miss playing girly dress-up and it would be nice to have some pretty dresses and cute shoes now and again for going out in. Rocking up in my traditional Chinese dress on the Yangtze cruise with trekking sandals took the edge of being ‘glammed-up’. We have also been to the theatre with board shorts on in Washington D.C. and the Bolshoi Theatre ballet in Moscow wearing scruffy snow boots and ski jackets. Even Gwyn felt embarrassed then and hid in his seat during the interval. These bits of poshness are few and far between though. I still take a hairdryer, but never use it. It’s just not needed in hot countries. Saying that I prefer it being there, in case I do want it. Obviously, without a van, I’d probably dismiss this item in my backpack. Gwyn never uses his shaver either. He has embraced the beard. Electric toothbrush –there are plenty of cheap small buzzing toothbrushes from Boots that do the same job. Plus an electric toothbrush is just another thing to charge. It feels our selection of heat packs have travelled more than we have. We take them everywhere, but we have decent ski gloves, so we just don’t use them. I am still convinced they’ll come in handy for Antarctica though. Binoculars – only ever used them on game drives in Africa. For this next expedition, we’ll be more vigilant with packing and will be writing something about this soon.